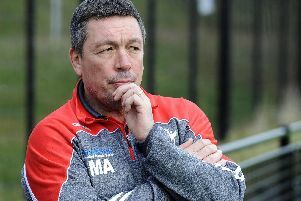 It’s a day that’s never too far away from the lips of rugby league aficionados when the Challenge Cup gets a mention, and it’s a day Mark Aston never gets tired of talking about. When Catalans Dragons face Warrington tomorrow afternoon in the Challenge Cup Final, there may be the odd reference to the triumph by Sheffield Eagles over Wigan in that famous upset 20 years ago. Members of the 1998 squad, including Aston, will be present to mark the 20-year milestone at Wembley, and the current Eagles director of rugby says there is still a ‘twinkle’ in the eyes of those that played, as he hopes the reunions continue for years to come. “People will always talk about it because it was the biggest upset in rugby league I would say,” Aston explained to The Star. “Do I often think about it? Yes. “When we see each other there is that twinkle in the eyes of the boys who were there and who were part of it. Darren Shaw sends me messages on Whatsapp often. “We still talk about it because we are still close albeit he's in Australia, we are over here and we don't get to see each other. When you have a special memory and have moments like we did, you'll never forget. “We'll always celebrate that time and that history, and when it get to 30 years or 40 years, hopefully we'll be still around and we'll still be celebrating. Should the Dragons upset the form book and defeat Warrington, it won’t quite match the upset the Eagles provided to stun Wigan in that famous final. Steve Price’s team will be the favourites, but Aston admits a historic win for the French side is certainly not out of the question. “It is possible that Catalans can win it,” he added.